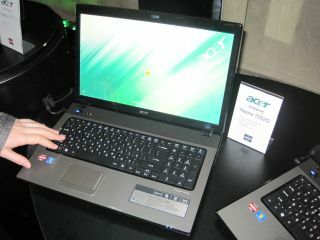 Acer unveiled a plethora of new notebooks, netbooks and even desktops at an event in Cannes yesterday. The launch was designed to coincide with today's advent of a new generation of AMD Vision technology, but since the preview happened yesterday and has been under embargo until now, we're left wanting in terms of exact specs. We'll bring you more from the AMD event later on TechRadar. The Vision tech combines AMD's latest-gen Phemom mobile processors together with ATI Mobility Radeon graphics. Topping out the line-up is the Aspire 7552G, with the Black spec of the Vision technology. That means it has a tasty Phenom II auad-core chip under the hood as well as a 17.3-inch LED-backlit HD screen with native 16:9 aspect ratio. A Blu-ray drive and HDMI out are also standard - you can see some images of the 7552G above and below. Acer's entire new range includes three notebook series – the thin and light Aspire 5625 and 4625, Aspire x551 and Aspire x553 - available in 14.1-inch, 15.6-inch and 17.3-inch configurations.